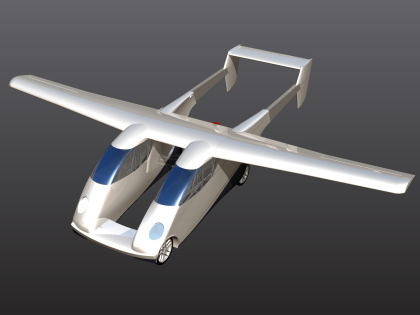 The German firm Carplane made an entry into the media a few years ago, especially when it compared its bi-modal flying car with a Burt Rutan design. That started a brief kerfuffle of edgy comparisons between the two groups, but no necessary winner. Now, having shown at least a finished and apparently drivable vehicle at Aero 2015, Carplane has renewed prominence in the media. And the blog brings it all back, prepared for less-than-flattering comments. 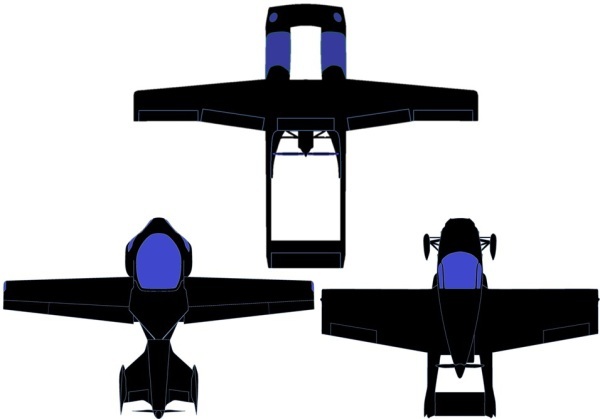 With a flying length of 7.453 meters (24 feet, 5 inches), and a driving length of 5.44 meters (17 feet, 10 inches) , Carplane’s tail section must slide in and out a bit like the tail section on the PAL-V One, essentially a flying autogyro. Its 9.715 meter wing (31 feet, 10 inches) has sailplane-like airfoils based on the wing’s root shapes stored between the two fuselages, and it has 10.72 square meters (115.4 square feet) of area. The airfoils must have some reasonably high lift coefficient to allow a stall speed of 36 knots (41.4 mph), comparable to a Cessna 150/152 with 160 square feet of wing area. An empty weight of 498 kilograms (1,097 pounds) and maximum takeoff weight of 750 kilograms (1.653 pounds) puts it solidly in the 150’s ball park. The 151 horsepower PC850 engine may account for the projected rate of climb of 351 meters per minute (1,150 feet per minute), something even a lightly loaded 150 could only aspire to. The engine, originally mounted in a pod above the fuselages, is now hidden between them, which allows for quieter operation, according to references quoted by Carplane. The gear system to drive both the rear wheel on each fuselage and turn the propeller when in takeoff and flight mode must be another instance of clever design. Using the rear wheels to help accelerate the takeoff run is an idea being promoted for upcoming Green Flight Challenges. Carplane claims a takeoff distance of only 85 meters (297 feet) using this extra push. As a car, the machine would run on the Autobahn at speeds up to 174 kilometers per hour (108 mph). With the required airbags and other safety gear, weight will have to be monitored very carefully. If Carplane can keep the weight within European LSA standards and obtain the performance they now predict, they will have lived up to their rhetoric. The at-least four-way competition has different configurations, design philosophies, and myriad details. We look forward to what comes next. We didn’t actually “make a comeback” because we weren’t gone. 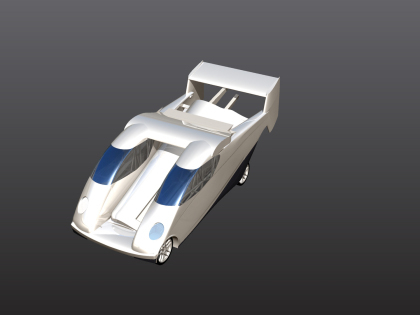 Back in 2011 we simply said we’d build our vehicle and planned to finish it by 2015. Then we did what we said (unusual for an aviation company). The “kerkuffle” you refer to involved us pointing out that Burt Rutan (without knowing it) falsely claimed to have been the first to come up with a twin hull flying car. We pointed to our earlier patent and publications (which Burt acknowledged).